Mott’s 3D technology makes it possible to make custom sintered metal filtration and flow control products. 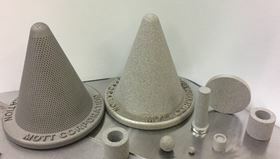 Mott Corporation says that it presented a range of 3D printing porous technology at the International Conference on Sintering held in San Diego, California, USA, in November. Dr Vince Palumbo, a metallurgists and 3D printing experts at the company, also spoke about the latest advances and capabilities in porous manufacturing with additive technology. The presentation Selective Laser Sintering techniques for Improved Porous Media Performance was also co-authored by Dr. James Steele, Dr. Aravind Mohanram, and Scott Lagocki, Rapid Prototyping Lead Technician. Mott’s 3D technology makes it possible to make custom sintered metal filtration and flow control products that can provide a more uniform pore size distribution and flow. This story is reprinted from material from Mott, with editorial changes made by Materials Today. The views expressed in this article do not necessarily represent those of Elsevier.